- darbas su biuro programomis (MS Office, OpenOffice ar pan.) patirtis. - draugišką kolektyvą bei geras darbo sąlygas. 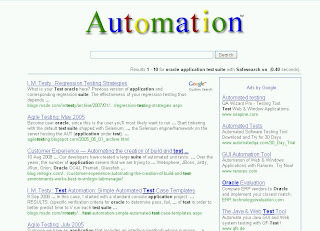 Time from time while searching in the web I find interesting stuff, relating testing. Mostly grammar small bugs. Decided to share with you. everyone has been talking about crisis, The Crisis, already more than a year. so, what is the crisis impact for software testing and testers? "software consulting firm Ovum claims that the worldwide software testing services market is projected to reach 56 billion dollars by 2013, despite the global economic crisis". In my background, all IT sector has less sofware projects. Companies save money first of all cutting IT expenses. IT software companies may start saving with fewer testers. One person commented: "a client does want to buy testing services. He will test the product himself". Developers and coders are more valuable - they code and then test the product. And the tester remains as a luxury for better times. When considering among testers, company would necessarily cut manual testers first over technical testers. How do you feel crisis as a tester? My late impressions on ‚ 10th Annual Conference for Testing Professionals "TEST MORE FOR LESS". One day conference, starting early in the morning. Had a chance to see Riga old town in the evening. The organisers of the conference really worked hard. Our company group enjoyed everything – the presentations in English, the time management, coffy breaks and tasty luch. Now, the program and all conference material are available at is.lv website. The main impression – automation and agile rules. Last year we also switched from waterfall to RUP iteration. and starting more serious automated testing.. There will be a chance to take ISTQB Advanced level exam. Anyone from LT interested? While reading the last issue of Testing experience, found a short message: 'Industry Leaders Announce New Software Quality Testing Certification'. 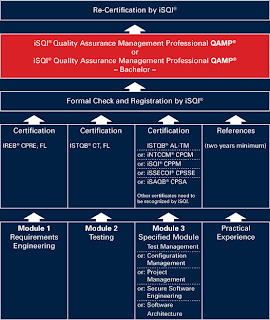 QAMP® - Quality Assurance Management Professional. It sets high standards - to a broad theoretical knowledge – which needs to be demonstrated by 3 successfully passed certification examinations – it attests the practical knowledge and project experience of the certified employee. Theoretical and practical knowledge both have to be updated annually. Upon completion of all three certificates and proof of the two year practical experience, the participant will be certified as iSQI Quality Assurance Management Professional (QAMP). In case the applicant is not able to submit evidence of practical experience (e.g. graduates) the applicant will receive the status iSQI Quality Assurance Management Professional (QAMP) - Bachelor. Attached the certification schema, not easy to understand. I suggest visiting their site, www.qamp.org. Good title of the post. If you have questions about advanced ISTQB certification in Lithuania, the only answer is - not possible (only foundation level). For the moment, there is no testing board in Lithuania, so decided to write where you may take the tests for advanced certification. Polish Testing Board (www.sjsi.org)works over 6 years. There would be no problem (i guess) to take the exam. The website is really full of information, even with the statistics - pass and fail ratio. Latvia Testing Board is a few times younger. And for now they have accreditation only for Foundation Level. You may read more on their web site. the next testing experience will be issued in two weeks. If you’d like to get a printed version to your office or home address you have to register. The subscription including shipping is 32 EUR for a year or 60,- EUR for two years. You can pay with payPal or we can send you an invoice. Our company "Interneto marketingas" is currently recruiting a Quality Assurance Specialist who will be responsible for maintaining all QA functions including establishing and enforcing QA procedures and standards, testing websites and web applications, identifying defects, finding and reporting errors and/or missed functionality as per business requirements. This is a great opportunity for an individual who wants to be a part of a rapidly growing company. The person hired will be the onsite expert and will lead the Quality Assurance function throughout the company growth cycles ensuring that quality is always in the forefront in order to meet the company targets for growth & profitability. * Degree in Information Technology or related field preferred with a minimum of 3-5 years QA experience.